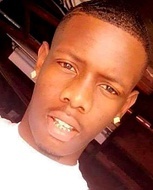 Arthur Theodore Givhan, a 19-year-old black man, was shot and killed Friday, Oct. 14, near the northeast corner of 107th Street and Western Avenue in the Gramercy Park area of South Los Angeles, according to Los Angeles County coroner’s records. Givhan was walking with a friend when a light-colored sedan traveling west on 107th Street stopped at the intersection, said Los Angeles County Sheriff’s Lt. Joe Mendoza. about 7:09 p.m.
Givhan and his friend argued with the people in the sedan, Mendoza said, and then walked away. A second light-colored sedan pulled in behind the other car as two black men walked up to Givhan and his friend. The two men on foot began shooting, Mendoza said, striking Givhan and his friend. The shooters then got into the second light-colored sedan and both cars sped away westbound on 107th Street. Givhan, a resident of Inglewood, was pronounced dead at the scene at 7:20 p.m. with a gunshot wound to the head, according to coroner’s records. His friend, who was shot in the lower torso, was taken to a nearby hospital and is expected to recover, Mendoza said. To my son, my baby boy I miss you so much. From the day you was born I knew you was not promised to me for life. For you to be murdered at the same age as my brother is so much harder. I look at your pics and urn every day. The person that took your life I pray for him and trust me its the hardest thing ever to do at this time. My life may never be the same. Myself and your dad is bringing your son up in the best way possible. We all are having it hard missing you and you not around. I just ask God to give us strength every day. I Love and miss you so much......RIP my son, love ma as you would say! — Valencia Fisher'Givhan April 6, 2017 at 1:32 a.m.
My baby boy I know God only lend you to us for a lil while. Right now my heart is so heavy and my eyes are fill with tears. Nobody could have told me that you were going to leave me I would have held onto you a lil tighter. Baby I love you soooooo very much words can't explain how I feel . I miss you every single day it's not a day that goes by and I don't think about you. Miss them juicy lips kissing me baby I just miss you it not same without you. I don't think I will every be the same after losing you. You was my ride or die baby always looking out for me I miss that. Love you tell the wheels fall off RIP My Baby Boy. — TEE TEE Feb. 2, 2017 at 12:50 p.m.
— Shakir downing Oct. 30, 2016 at 3:38 p.m. Your death has shown me what I need to do. You will be missed, artie. I will do my best to change things and prevent parents from ever having to bury their child, due to this nonsense we have going on in black neighborhoods. Many things I do from here on out will be done in remembrance of you and many others, and I promise I will help out your mother and son every chance I get. I love you, and I wish I was around more; rest well. — F Oct. 25, 2016 at 12:39 a.m.
— pavlina Oct. 24, 2016 at 8:21 p.m.
— Auntie valerie Oct. 21, 2016 at 9:18 a.m.
— Auntie Dee Oct. 19, 2016 at 7:06 p.m.
— Michael Eric Daniels Oct. 18, 2016 at 11:11 a.m.
Sleep well Artie, we gone miss you. — Jecorey Jackson Oct. 18, 2016 at 10:20 a.m.